But I genuinely feel like the LG G5 breaks that mold. It has a replaceable battery that’s removed through a unique detachable bottom, it has a fingerprint scanner and power button on the back side of the phone, and it has two rear-facing cameras. That’s the most unique mainstream phone out there right now. Let’s take a look at everything this device has to offer – and we’re giving this one away to one lucky reader! Design-wise, the G5 has gone in a relatively different direction from last year’s G4 (our review LG G4 Review and Giveaway LG G4 Review and Giveaway The LG G4 refines what was great about the G3, and it manages to stand out in a crowded market thanks to a great camera, removable battery, gorgeous screen, and optional genuine leather back cover. Read More ). This all-metal design is sleek, and also kind of slippery. It has a slight curve around the edges, but it also has sharp corners. It definitely feels and looks premium, but does so without copying from Samsung, HTC, or Apple. The screen is 5.3″ with a better-than-Full-HD resolution of 2560 x 1440px, so rest assured that you won’t see any pixels here. Also, it is an astoundingly bright screen that does very well outdoors. Compared to my OnePlus One and the new HTC 10, the LG G5 is the brightest by a long shot. The volume buttons, which were on the backside in its previous iteration, are now nestled in the standard upper left side of the phone. However, the power button, which now doubles as the fingerprint scanner, was left on the back — we’ll discuss that later. The two rear-facing cameras sit just above the fingerprint scanner. Along the top is the headphone jack, while the ride side has the slot for the nanoSIM and microSD card (up to 2TB), and the bottom is home to the USB Type-C charging port and the lone speaker. The bottom section is actually removable. There’s a small button on the lower left of the device that you hold down while you pull it off. Annoyingly, when it’s attached, it doesn’t sit perfectly flush with the body of the phone, so there’s just a little ridge on the front and back. Overall, the G5’s design is a marked improvement over the chunky faux leather G4. This is now a true contender for best premium smartphone. Those three thin slots on the bottom of the G5 might not look like a booming speaker, but in my testing, it was surprisingly loud — louder, in fact, than the OnePlus One and HTC 10. On the G4, the speaker was on the backside, so upping the volume and placing it on the bottom is a big win here. Well, it wouldn’t be a flagship phone without a fingerprint scanner. The big difference here is that LG’s is on the back. It’s still incorporated into the home button, so you can wake and unlock the device by just resting your finger on that circle on the back. Depending on the situation, this can either be very convenient, or very annoying. If you pick up your phone one-handed, that’s likely where your finger will land anyway. But if it’s resting on your desk, or you just grab it by the bottom to tap away with your other hand, you’re out of luck. You’ll just have to type in your backup PIN to unlock it. It’s fast, of course, and you might as well use it in addition to your PIN lock, but the rear design is really up to personal preference. If you wanted unique, you found it. The G5 has two rear-facing cameras, one 16MP and one 8MP. The reason for that is the 8MP is wide-angle, so if you want to capture a whole scene that the 16MP shooter can’t (without doing a panorama), just switch to the 8MP. In my tests, they both did really well. I absolutely love the wide-angle lens. 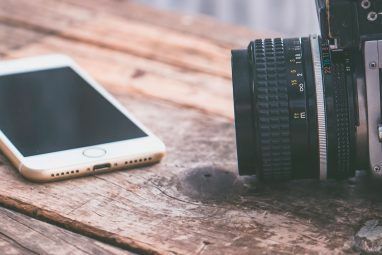 People actually buy add-ons for their phones Super Zoom & Lens Tips for Your Smartphone Super Zoom & Lens Tips for Your Smartphone While our smartphones are equipped with better cameras than ever before, we're still stuck with the same digital zoom technology that's been around for years. That's because there's no fixing digital zoom - it's permanently... Read More to have a wide-angle effect, but here you have it built-in! Above, you can see a photo of a tree using the regular 16MP camera. And this is a photo from the exact same location, only using the 8MP wide-angle camera. Honestly, the wide angle camera adds so much value to this phone. 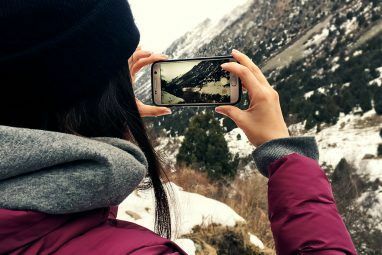 It’s quick and simple to switch between them (a one-tree button for regular, three-tree button for wide-angle), it’s extremely useful for capturing large areas, and it’s something no other phone offers. The G5’s main “gimmick” is its ability to swap out the bottom section for different modules that LG calls Friends. Currently, the only one available on the market is the LG Cam Plus, which adds a physical grip for taking photos and costs $70. In the coming months, we should see another module from Bang and Olufsen called the Hi-Fi Plus for improved audio, and possibly others. Perhaps the nicest part about the removable modules, though, is that LG has solved the age old problem of unibody metal design vs. removable battery — by giving us both. You could swap out your battery in seconds and get on with your day. Android manufacturers love to mess with stock Android Android Skins Explained: How Do Hardware Makers Change Stock Android? Android Skins Explained: How Do Hardware Makers Change Stock Android? Hardware makers like to take Android and morph it into something that is entirely their own, but is this a good or a bad thing? Take a look and compare these different Android skins. Read More — and LG’s at it again. This time, they’re calling it UX 5.0, and it’s a tweaked version of Android 6.0 Marshmallow. It’s not an unattractive skin by any means, but it’s certainly different than the stock experience Get the Stock Android Experience on Any Phone Without Root Get the Stock Android Experience on Any Phone Without Root A lot of Android devices have very customized interfaces, but you can get a stock Android look without even rooting your device! Read More . The biggest difference is that there’s no app drawer; all your apps are just out on the home page. Just like iOS. If you don’t like this, you could always just get an alternative launcher Which Android Launcher Should You Use? We Compare the Best! Which Android Launcher Should You Use? We Compare the Best! These awesome launchers will have your Android device feeling brand new. Read More . Other than that, you’ll probably notice the white notification menu and modified Quick Settings. The normal Settings menu has also been split up into four tabs. Here, you can add or remove buttons from the navbar, or change it’s default color, which is a nice change. LG has also pre-loaded a bunch of apps (which some might call bloatware), like LG SmartWorld, LG Backup, QuickMemo+, LG Health, LG Friends Manager, and others. One helpful app is Quick Remote, which allows you to control your TV using the built-in IR blaster. LG also just swapped out a lot of the default apps for their own, like the Calendar, Calculator, and so on. And strangely, the DPI is super high. This was one major problem Top Six Best Features Of The OnePlus One -- And One Drawback Top Six Best Features Of The OnePlus One -- And One Drawback I've been living with the OnePlus One for a few weeks now, and it's amazing, but it's not perfect. Let's run through some of the best features -- and one downside. Read More I had when I first got my OnePlus One, because when a phone’s DPI is too high, it (counter-intuitively) means that everything appears larger. For instance, compared with the HTC One (which has a smaller 5.2″ display), the G5 actually shows far less information — less of a web page, less of a text message conversation, etc. That’s because it’s just showing everything larger. If you have bad eyesight, that’s fine, but I prefer smaller information so I can fit more on the screen — and the G5 has no way of adjusting that. Due to the power button being on the back, the G5 also supports double-tap-to-wake and double-tap-to-sleep on the lockscreen and notification bar, which I found myself using a lot. The relatively small 2,800mAh battery usually lasted me through the day, but it wasn’t spectacular. I would get around 4 hours of screen on time on average, depending on my brightness settings. Heavy usage could certainly kill it before the end of the day. However, what was spectacular was how fast it charged. It went from dead to 100% in about an hour. That’s incredible. If you’re willing to plug it in for just a few minutes in the afternoon, it could get you a lot of extra life. Also of note is the new USB Type-C What Is USB Type-C? What Is USB Type-C? Ah, the USB plug. It is as ubiquitous now as it is notorious for never being able to be plugged in right the first time. Read More port, which is wonderful and reversible and not backwards compatible with old micro-USB ports. You’ve been warned. At the end of the day, the G5 has very similar specs to a lot of other flagships. The Qualcomm Snapdragon 820 processor and 4GB of RAM are obviously powerful. What your decisions comes down to should be based on the expandable storage, the removable battery, the wide-angle camera, and if you like LG’s software. If you find those things to be gimmicks and prefer stock Android, you might want to keep looking. Explore more about: Android Marshmallow, MakeUseOf Giveaway, Smartphone Photography. I currently have the Lg g2 and this phone exhibits a drastic change that is unparalleled in the market today. Thanks for the giveaway; I would love it. Would be awesome to have this phone! Thanks for the good review! As an LG G4 owner, losing the chunky, recessed rear volume control is my biggest turn off for the G5. I find that I hit the volume control on accident much less frequently when it's positioned there vs. the side of a device. With regard to bloatware, while it's exceedingly difficult to root LG devices to achieve full removal, I haven't found an App yet that I couldn't disable via ADB commands. I don't even use LG's dialler or contacts apps, let alone the Health Monitor or Memo tools. I hadn't noticed the issue with the App Drawer in LG's new launcher, but it's surprising since the G4 experience is reasonably close to stock Android. Two rear facing cameras hmmm! Please guys make also a review with LG G5 friends. Thanks! A top notch phone makes for a wonderful prize! Yes please! Thank you so much, As always clear and detailed review. Do you guys thinks G5 is a decent upgrade over G4.....? As always great detailed review. Please God let me win just this one time.. I like the new LG G5 design and the detachable battery. I didn't know it wouldn't lay flat down though. Finally a decent review! I've been made to feel bad about my purchase since I got it but honestly I've been pretty happy. I kinda feel she's a hot girl in ugly clothes. Idc what people say, when we get home we get it on. Really excellent review. Loved the video! Like the new LG5 Phone! Good luck! Awesome giveaway! Good luck everyone. "...with a better-than-Full-HD resolution of 2560 x 1440px" This is commonly referred to as "1440p" or "QHD" (Quad High Definition, since 1280x720 is the minimum for HD, and this is 2x that in each direction). Except the looks of the backside this phone is rocking.i hope i get lucky.been trying from long. 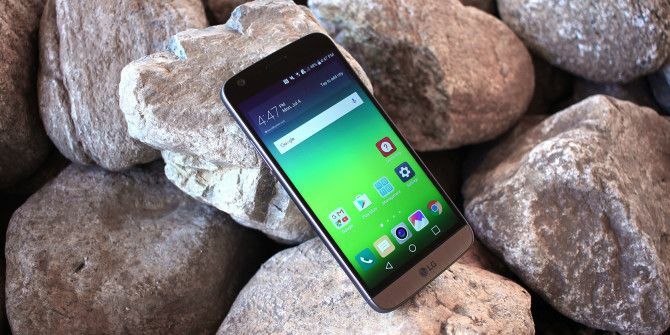 Most the reviews of this phone seem to put the LG G5 in the spotlight. To me no phone is worth $600 but it is a pretty good phone to use your money on if you're rich. how will I know if I win and how will you send it to me? There's a section partway down the page with the heading "12 Ways to Win." You may need to sign in to see that section - I'm assuming they will notify you via email, and there's usually also an article with the list of winners. I've read the review of this cellphone (even watched the add in the t.v), I am very much impressed with the features of the camera. I just hope that the life of battery will last long. Lastly, may the LG G5 be a more user friendly phone, having lots of new and positive features like tapping the screen to switch it on and off. Have had my G5 for several months and I absolutely love it! Battery charges extremely fast, great resolution and speaker. Best phone I've ever had hands down!